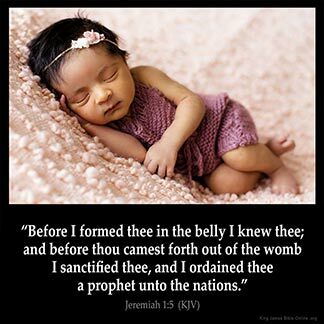 JEREMIAH 1:5 KJV "Before I formed thee in the belly I knew thee; and before thou camest forth out of the womb I sanctified..."
2To whom the word of the LORD came in the days of Josiah the son of Amon king of Judah, in the thirteenth year of his reign. 3It came also in the days of Jehoiakim the son of Josiah king of Judah, unto the end of the eleventh year of Zedekiah the son of Josiah king of Judah, unto the carrying away of Jerusalem captive in the fifth month. 4Then the word of the LORD came unto me, saying, 5Before I formed thee in the belly I knew thee; and before thou camest forth out of the womb I sanctified thee, and I ordained thee a prophet unto the nations. 6Then said I, Ah, Lord GOD! behold, I cannot speak: for I am a child. 7But the LORD said unto me, Say not, I am a child: for thou shalt go to all that I shall send thee, and whatsoever I command thee thou shalt speak. 8Be not afraid of their faces: for I am with thee to deliver thee, saith the LORD. Before I formed thee in the bellie, I knew thee; and before thou camest forth out of the wombe, I sanctified thee, and I ordeined thee a Prophet vnto the nations. Before I formed thee in embryo I knew thee; and before thou wast born I sanctified thee, and I ordained thee a prophet to the nations. Before I formed you in the belly, I knew you. Before you came forth out of the womb, I sanctified you. I have appointed you a prophet to the nations. 1:5 I sanctified - I ordained thee for this public service. He speaks thus to Jeremiah, not to the other prophets, because he stood in need of greater encouragement than they, both in respect of the tenderness of his years, and the difficulties which he was to encounter with. The nations - To other nations besides the Jews. If you have a special love for God and righteousness, a word of God of this form declares who you are, how you are, and for what reason are you like this. God sanctifies people since they were in the womb. God also know some people before ever they were formed or created in the womb. That 's a special knowledge of such people and not just the Omniscience character of God. This verse reveals to us that God has a purpose for all His children. no matter where you are born,country,village, family, He has a purpose for all. wooow, God knows you and me...glory to His Holy name. It is unspeakable joy, to understand that God knew us before we were even in our mother 's womb.I am confident that despite the momentary hardship here on the earth, God already won the battle for us all.My God is truly AWESOME and WORTH TO BE PRAISE FOR EVER AND EVER, AMEN!!! !